This middle school student writes a persuasive letter in hopes of getting a job. Rusty Silhacek is my neighbor. He said that you’re pretty busy, and I was wondering if you could use some help. I’d like to be your part-time vet assistant. I’ve had a lot of experience taking care of animals—feeding, bathing, exercising, and cleaning up after them. I know that all animals need special care. I would be able to help after school and also on weekends. Please call me if you would like to interview me. I can be reached after 3:00 p.m. at 523-4418. Thank you. 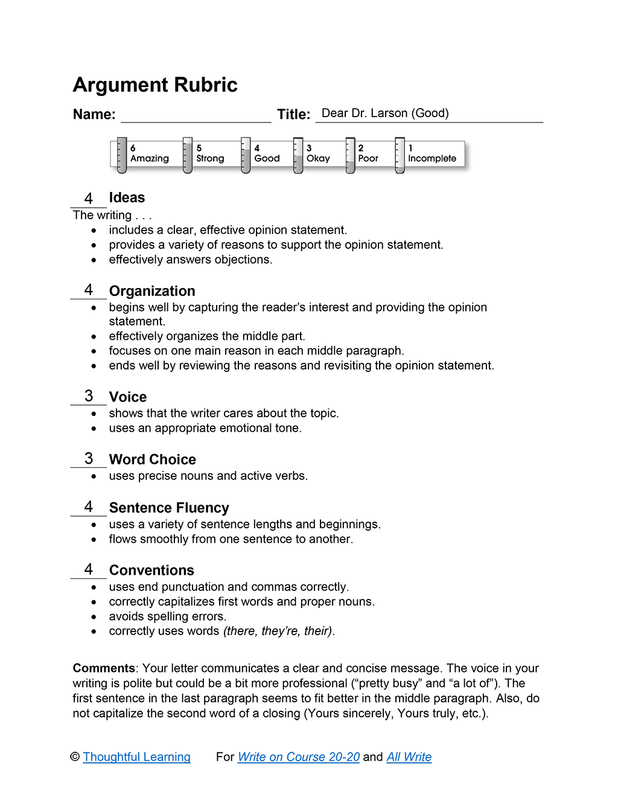 Dear Dr. Larson (Good) by Thoughtful Learning is licensed under a Creative Commons Attribution-NonCommercial-ShareAlike 4.0 International License. Based on a work at k12.thoughtfullearning.com/assessmentmodels/dear-dr-larson-good.